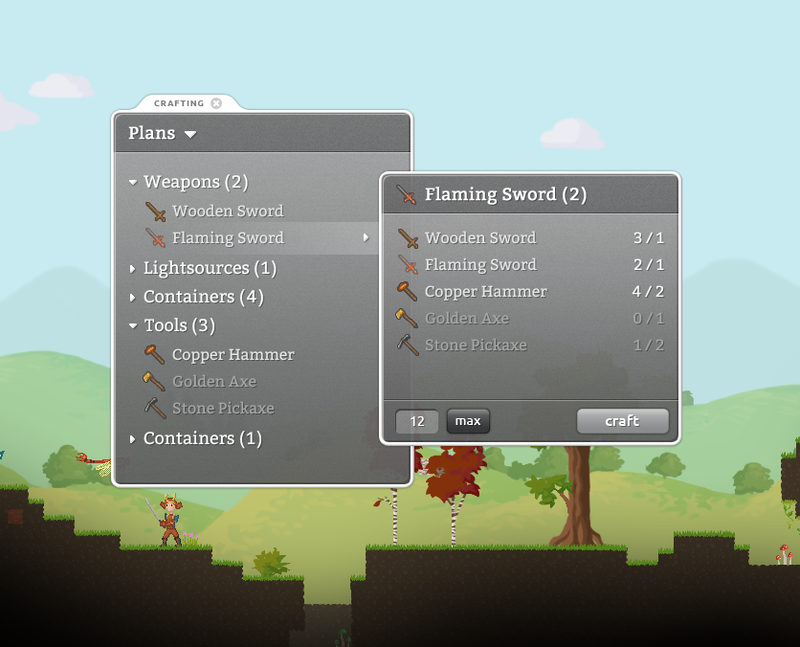 David, our awesome UI Technician, has put together a page that features the crafting in Crea. Be sure to check it out - it even has some new artwork! We would love to know if you like this format and want to see more features like this. We have also been working on reworking the UI. This is a mockup of the crafting interface. What do you think? Very simple and nice UI indeed. the search function would surely be helpful as the list grows and the real time results as you search will be great. It reminds me of the crafting system in world of warcraft but it is different due to the research, it is centralized and less random on chance than in world of warcraft. I've considered this typing feature. Kind of like Google's auto search. You can start typing a name and if you pause for a moment it will then search for that item. This is something I am continuing to keep in mind. With the other filtering methods already in place, I want to see if it is actually needed. It does add some complexity such as you need to be able to clear your search filter. Thanks for all of the comments. Loving the feedback! Nice! I agree that this font is easy on the eyes, and the layout in general is nice to look at. I don't want to be a nag, but there is one thing that irks me a little, and that is the slight overlap of the two pages. I font know why, but it kinda gets to me. Anyway, that's a trivial detail, and I have to say everything else looks great! Nice re-desing indeed. But I kind of agree with Andrew on the search feature. Mostly with the easyness of moding: the amount of craftable items may become fastly uncontrolable and filtering by point and click, however a nice solution, can be quite slow for power gamer. What would you think about adding this feature: once on the crafting list (or any inventory), the player can start typing the name of an item and the list of available items will then be reduce to thoses wich have a name containing the text provided by the player. Glad you guys are digging the UI. I really like it too. David did a great job. I too really liked the crafting placement in minecraft but it has a problem with discovery. This is something we are trying to avoid in Crea. I am considering adding some more interactive crafting but that would be introduced later on. I quite like this UI, nice and clean. I found Minecraft's crafting UI very daunting when I began, and still now forget what pieces go where to make what. Just a suggestion though, I can see the list of items growing extremely large, and there being a *lot* to scroll through - particularly when people begin to mod in extra items to create. Terraria had this problem too, where standing in front of an anvil with some iron bars would make a ridiculously long list of crafting items. Perhaps adding a search bar/feature would help mitigate this? One of the things that I really liked about Minecraft (and to a lesser extent previous versions of TF2) was that the crafting interface had a certain feel to it - you laid out certain items in a certain way, and got something out of it. This was rewarding for the veteran player because you understood what patterns made what - you didn't need to go through a long and complicated process of clicking through all the possible end items to find the single item you wanted to make, you just arranged your materials on the bench in a way you'd done a hundred times before. On an unrelated note, the use of a serifed font is oddly relaxing in the UI. Looks very nice and open, comfortable on the eyes. Like the UI look. Simple, elegant and not too much extra frills that detract from what you are doing. Thanks for the kinds words Sandman! We spent a lot of time simply trying to find a basic UI style that would be easy to use but also out of the way. If you like this, you will dig some of the new UI mockups we've been working on and will release in future updates! David Classy UI work, As a designer I know UI design is its not easy and you and the team have nailed it here, great job, thumbs up all. Can't wait to play Crea. Haha, yeah... We noticed that before but forgot to fix it. Then after I posted it I saw it again and was hoping no one would notice. Oh how I was wrong. I'll fix it up later today when I get a chance.